The TPP is not the only game in town and other possibilities exist, according to analysts. Vietnam should have a Plan B for foreign trade and not be overly concerned that the TPP may not come into being, analysts have advised. It is too early to declare the TPP dead but it is definitely on life support, according to Emeritus Professor Carl Thayer from the Australian Defense Force Academy. US President-elect Donald Trump announced on November 21 that the US will withdraw from the TPP on the first day of his presidency and instead pursue free trade agreements (FTAs) on a bilateral basis. The bottom line, according to Professor Thayer, is that the TPP Vietnam signed but not yet ratified is unlikely to be ratified by the US in its present form. Six of the eleven TPP signatories already have FTAs with the US and the other five enjoy low tariffs, he added. Mr. Dezan Shira from Dezan Shira & Associates also believes that Vietnam, together with other countries, must continue with other deals. “With the diminishing prospects for the TPP it is now possible that countries such as Vietnam and Malaysia, which had made substantial compromises on issues such as labor rights, will now have to move on to other deals,” he said. Mr. Pham Hong Hai, CEO of HSBC Vietnam, said that too much focus is being given to the possibility that the TPP will not proceed and have forgotten that negotiations over other FTAs are ongoing. A bigger deal is the FTA of the Asia Pacific (FTAAP), an initiative nurtured for 20 years by APEC that links 21 economies around the region, including China and the US, he said. The FTAAP covers 60 per cent of global GDP and 50 per cent of world trade. The bulk of the FTAAP is complete and the final chapter is being worked on. 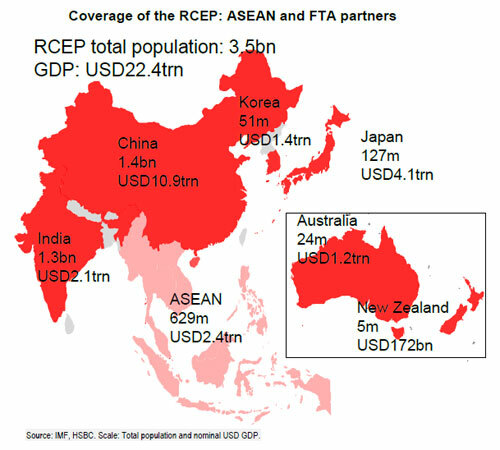 The RCEP, which links the world’s three largest consumer markets - China, India and ASEAN - creates a free trade area between 16 Asian economies generating around $22.4 trillion in GDP and about $10 trillion of total world trade, according to HSBC research. “This deal will be particularly advantageous for ASEAN as it will reduce the incongruity across pre-existing FTAs and thereby strengthen the appeal of the region as a production base,” said Mr. Hai. Negotiations over the RCEP are ongoing and the 15th negotiating session concluded in October. The RCEP includes ASEAN-10, China, India, Japan, South Korea, Australia, and New Zealand; countries with which ASEAN already has FTAs. As the first pan-Asia free trade deal it boasts a list of impressive figures, such as covering roughly half of the world’s population and nearly 30 per cent of global GDP. Mr. Shira, however, noted that the RCEP is of a lower standard than the TPP. “The RCEP does not include provisions that emphasize the protection of intellectual property, the free flow of information, or the leveling of the playing field between private businesses and State-owned enterprises,” he said. Unlike most other FTAs, the TPP included special provisions on areas such as labor standards, governance and transparency, and environmental and intellectual property protection, Mr. Shira added. Looking ahead, Professor Thayer predicts two scenarios if the TPP is killed off. The first is that when Mr. Trump appoints his Secretary of State it might provide an opportunity to look again at the TPP and perhaps re-open negotiations to get US agreement. “But we do not know who the new Secretary of State will be,” he said. The second possibility is that Southeast Asian signatories to the TPP could move to bring forward discussions on the RCEP, including China but not the US.